1/8" Swivel Frame Clip, Brown - Sliding screen doors, screen frame, porch screening, window screens. 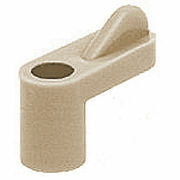 * Used for surface mounting of screens and storm windows. * Clips swivel out of the way for easy installation and removal of the units. * One package contains 25 Swivel Frame Clips and 25 screws.